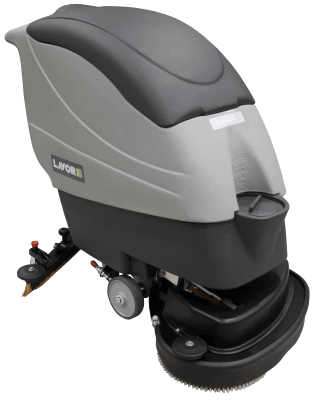 Suitable to work for the maintenance and deep cleaning of large areas (up to 2,200 m²). User friendly control panel: forward speed setting, scrubbing and vacuuming selectors, battery charge indicator, traction direction indicator, key main switch. Large handle with traction driving lever for forward and backward directions. Quick vacuum motor and filter inspectionwithout tools. Detergent solution tank with large opening protected by quick locking cap. Parking brake directly on the wheel. Easy squeegee regulation without tools. Hour meter and solenoid valve. General ON/OFF switch and key switch, brush and vacuum motor switch. Thermal circuit breaker to protect vacuum motor and brush motor, battery level control, hour meter. Easy access to battery and vacuum motor compartment, without using tools. Large tank capacity, at the top in the category (67 l). 2 x 12V -118 Ah C5 batteries to grant long work autonomy, up to 3 hours. Quick battery charger plug ?tting. 15 mm Heavy duty steel monobloc brush plate. Great pressure on the ?oor for a deep cleaning even on the toughest dirt. Solenoid valve to stop the detergent water out?ow during the work interruptions.